The star of this necklace is the gorgeous hand cast bronze petroglyph pendant by Nancy Young which I purchased from her probably around 1995 or so. 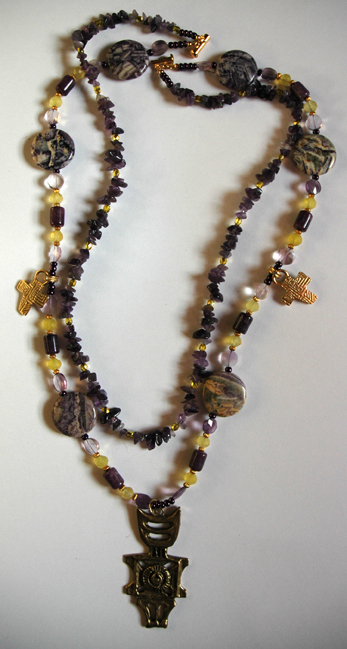 The large beads are charoite, the purple cylinder beads are lepidolite and the chips and buttons are ameythst. I do not know at the moment what the yellow-green faceted bead is but I hope to find out. The two charms were found earrings. I am a huge fan of Nancy Young’s work and wish I had bought more of her castings when she sold them to the public because I believe now she produces them only for her own use. They are gorgeous work. I made this necklace over the weekend. It’s the first beaded project I’ve done in years. I have a lot of beads. Remember what I’ve told you about my definition of “a lot”. That’s been coming up a lot lately, hasn’t it? haha. I was reminded of the old joke “how do you eat an elephant” answer “one bite at a time”. So since my beads are sorted by color I decided that I would work monochromatically for a while until I started feeling more comfortable working into those file drawers. 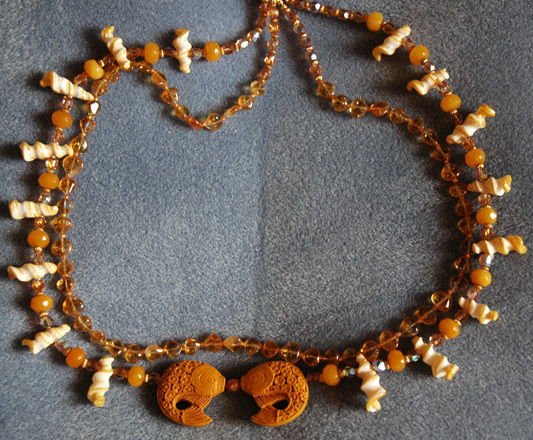 The necklace is worked in yellow orange beads with two Asian designed carved fish to represent Pisces. (Remember, I am Pisces Rising). It also has citrine and yellow jasper, was well as shell and AB finished faceted glass beads. I used a slide clasp for the first time and like it; easy to take on and off and doesn’t take up as much room as a toggle clasp. There are also brass colored tiny metal beads for the “oooh shiney” I require. All in all, I’m pleased. Enjoy your day!